This article first appeared on the Writing.ie website in September 2015. The Backstory of a Book. 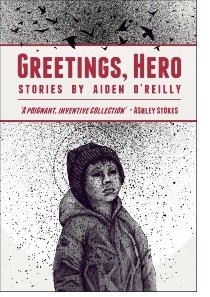 It’s been a year since my debut collection of short stories Greetings, Hero was launched to the world. My tales of drifters and deviants incapable of accepting any “central source of validation” were a long time in the making. The oldest was written in the Staatsbibliothek on Unter den Linden in Berlin, during a bitterly cold winter. Some others were written in Poznan, one in Prague, and several in Dublin. They were written slowly, left to mature, inspected, pruned with a buzzsaw to meet submission wordcounts, rejected, reconstructed, lost in virtual space, found again, re-edited. Subjected to the above cycle a few times, and perhaps somewhere along the line accepted by a magazine in Ireland, the USA or the UK. The route of any book to reach the world is a tale of persistence and serendipity. I’d been writing for a long time. Three and half novels are buried deep in zip files on my hard drive. The first one was written using WordStar on a DOS machine, an old hand-me-down. “You write beautifully and I have no doubt you are going to do very well,” replied one lit agent about the turn of the century. I didn’t doubt it either. I was living in Poland at the time, sending out submissions festooned with so many stamps that the address had to be squeezed in at the bottom. A package took three months to reach the UK. I knew nothing about the literary world. To give an idea of how out of touch I was, on a trip back to Dublin I enquired in Easons where the literary magazines were shelved. Soon after I moved back to Ireland I began having success with short stories. Back then – before 2010 – there were far fewer lit magazines in Ireland. (For a while The Stinging Fly went on hiatus, and there were basically none.) I tried UK and American magazines too, and the acceptance emails began to trickle in. I owe a huge debt to the editors of these magazines – The Dublin Review, The Stinging Fly, Prairie Schooner, 3am magazine, Stand magazine, and Unthology, among others – for their encouragement and patient editing, and for opening my eyes to what’s new in fiction. I never lost the feeling of being an infiltrator however – a person harbouring a deviant agenda, trying to smuggle himself into an environment where he did not belong. I didn’t actually know of any recent writer, then, who had achieved representation from a lit agent following an unsolicited submission, and most certainly not for short stories. So I didn’t have any realistic hopes. I knew the taste of good luck. A New York literary agent emailed me out of the blue once, saying he admired my story in the US journal Prairie Schooner, and had I a novel ready? I won the biennial McLaverty short story award. The very first play I wrote was accepted by the Cyclone Repertory and given a public staged reading at The Triskel in Cork. But I lacked luck in the area where I’d sunk the most time over the previous decade. It was proving very very difficult to get either agent or publisher to read my collection. Advice from inspirational gurus on how to cope with rejection began to grate on me. I used to dream of rejection. I longed for the opportunity to be rejected. Years went by with nary a rejection letter. (To clarify, my method was to send out a query + synopsis + one story. I didn’t count it as a rejection if a publisher declined to view.) And every time I clicked on any book-related article, the Motivators were sure to be out in force yapping that rejection makes you stronger. I began to feel it was arrogance to want to have a book published. Why couldn’t I be content to have single stories published indefinitely? Isn’t writing supposed to be its own reward? My state of mind vacillated between a total conviction that if my writing was good enough, I would have been ‘discovered’ long ago by talent spotters of unknown origin, and an almost equally absurd belief that if a publisher would just read the damn thing, they would inevitably feel compelled to publish it. I needed to move on to a novel or another play, but I also needed to take a more imaginative approach to getting my collection under the nose of a publisher. 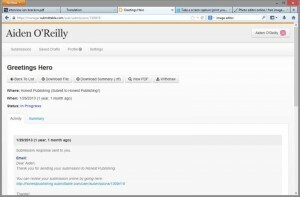 The big [UK] publishers state on their websites they only accept via an agent. By this stage I had about twenty-five short stories published and a McLaverty award, and I had not yet achieved a rejection for my collection. In a fit of hubris I composed a submission request to Faber & Faber. I referred to websites where lit agents state they do not handle short story collections. I quoted lit agents who said they hadn’t worked with an unsolicited submission in years. I edited it down to a concise 300 words, addressed it to a specific editor, and sent it off by registered post. The reply came back within days, saying sorry, but they would not read my submission. About a year later Faber announced they were bringing out a debut short story collection. Imagine my absolute disgust when I learned that it was from a publishing industry insider with no previous stories published. “Can they really do this?” I thought to myself. A big boo to Faber, and I prefer to read from publishers who spread their net further afield for debut fiction. I’d be a grovelling coward if I didn’t say that. I kept up the campaign, trying several tactics, not neglecting honesty, to blag my through the barriers. In early 2013 the dream came through. Quercus emailed me and said “Word is correct: we are not totally averse to the notion of short stories.” A month later they got back, saying they enjoyed the stories but it’s a tough market etc. This didn’t get me down. In this whole escapade of being and becoming, it was never rejection that got me down. Just over a month later an email bipped in the inbox from an outfit called Honest Publishing. They wrote that they had read my submission and wanted to know a bit more about me. I felt no tremor of excitement. I felt nothing. This was because I had never heard of them. I had no recollection of submitting. But the digital evidence was there. 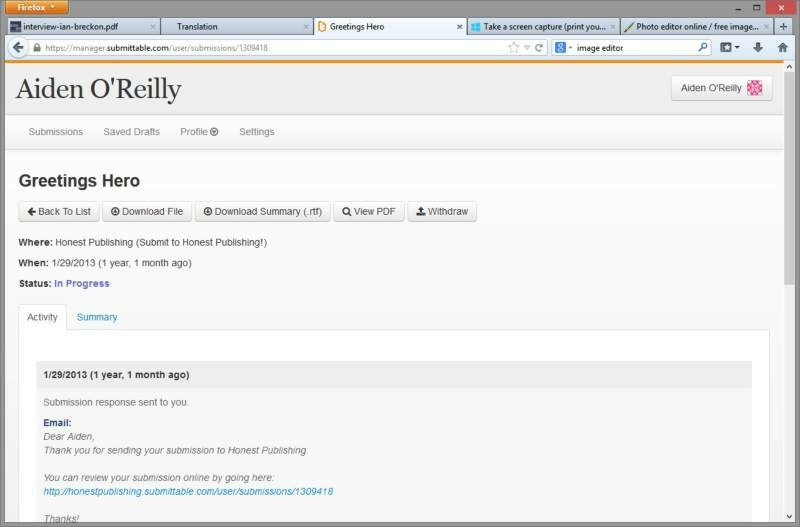 First thing I did was Google the publisher. Their website impressed me. As trivial as it might sound, what struck me most was the covers of their previous books. I got in contact and a few tentative emails were exchanged. I solicited the advice of some established writer friends. I let Penguin Ireland know the situation. Penguin Ireland had been the only other previous publisher to request to view the whole manuscript. They hadn’t rejected it, but had wished to view a resubmission in a couple of years. This was a major boost, but my style of writing was changing, I felt my new stories did not add coherency to the collection. Also I had no literary agent, and big publishers have a poor record of taking on unagented writers. I submitted the damn thing. They read the damn thing. They got back to me with an answer. Thus began a long tennis game of back-and-forth edits with the occasional dropped email to screw things up. The story of the cover design is an epic in itself – Slava Nesterov was the third artist to attempt the job. I never got the chance to thank my publishers in print. So I raise a glass to the team at Honest: Chris Greenhough, Dan Marsh, the proofreaders, and also to the cover artist Slava Nesterov way out at the edge of the Urals. The book slipped into the Irish literary scene without a ripple for the first six weeks. 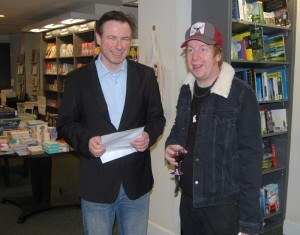 Then the English writer David Rose gave it an excellent review in Quadrapheme, and the following week Kevin Barry did the honours for a Dublin launch. A month later it had reviews in all three main Irish newspapers – a turbo boost for a book from an indie publisher. There you have it. The book that was rejected once.